Jackie Bouchard, a USA Today bestselling author, writes what she calls Fido-friendly fiction – humorous and heart-warming stories about people and the dogs that profoundly impact their lives. She spent a long time as a creative soul trapped in the body of a practical person. When she was bitten by the writing bug, she managed to leap free of the hamster wheel of corporate America, and now spends her days walking her dog, talking to her dog, and listening for the voices in her head that want their stories told. When the voices don’t talk to her, she can often be found staring into the refrigerator. After growing up in Southern California, Jackie moved to Bermuda, where she met her husband. Now back in San Diego, American Jackie, her Canadian hubby, and their Mexican rescue mutt form their own happy little United Nations. Her novels include "What the Dog Ate," "Rescue Me, Maybe," "House Trained," and "Stray Magic." And she promises that the dogs never die at the end! In Stray Magic by Jackie Bouchard, Cara Snow is perplexed when her fairy godfather, Vincent, shows up years after the ball—or in her case, the high school prom—is over. He offers her a chance at love after her marriage ends in divorce and on the heels of her daughter preparing to leave for college. You would think the fae folk would send the best of the best to rectify their mistake, but as luck will have it, Vincent’s botched spell leads to unexpected results. 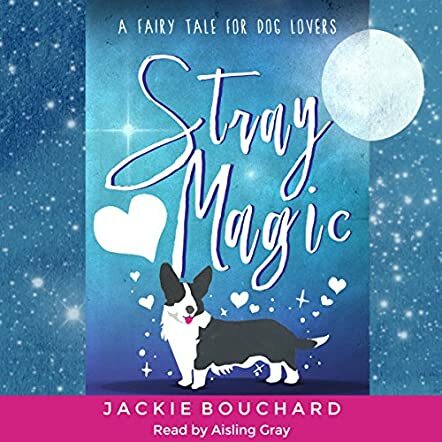 Jackie Bouchard brings new meaning to the word ‘stray’ with her modern day fairy tale, Stray Magic. While the second-rate fairy godfather adds an amusing touch of hilarity to a depressing situation, Cara’s own girl-next-door personality and her love of dogs are the driving forces that carry this romantic comedy into a special class of irresistible. Aisling Gray acts as narrator for the audio version of Stray Magic. Gray does a polished job of presenting a consistent voice to the story. Her performance stands out as well balanced without interfering with the enjoyment of the star of the story—the plot. The audio book is professionally engineered with no background noise or pacing issues either. I am torn between adoring Cara for the way she bounces back time after time from romances gone astray (there is that word again) and envying her taking her rocky journey into self-discovery with such grace. Had I faced even half the complexities Cara faced, I would have done more than just blamed teenagers on the growing pile of fast food wrappers in the car. I would have curled up on the couch with a gallon of Rocky Road and a blood vow never to date again. The description of this story states: it is loosely based on "Cinderella," and I agree that it is VERY LOOSELY based on the classic fairytale. I enjoyed this book much more than I did the fairytale version. Why? Well, let's start with the main character, Cara. She is not a doe-eyed innocent. Cara is a grown woman, with a grown daughter who is about to go off to college. To top it off, she has also just gone through a divorce which hit her self-esteem pretty hard. But, like many women, she did not allow herself to wallow in despair, she just moved on with her life the best she could. Sometimes it takes an exceptional amount of courage just to put one foot in front of the other. The introduction of a magical fairy godfather was hilarious. The author nailed this character. From his physical appearance to the clothes he chooses to wear, Cara's Fairy Godfather is a hoot. And of course, Cara, like any other sane person, reacts to his appearance and his pronouncement of his Fairy Godfather status by thinking he must be an escapee from an insane asylum. Cara works in a pet store and has a beagle as well who plays a prominent role in the story. Then of course there's the hunky guy from Cara's past. I loved the characters, I loved the setting, I love dogs as much as the protagonist does, I am also around her age, and my kids have left home to go to college as well. So, suffice it to say that I very much relate to the book's central character. *Thank you to Aisling Gray for providing me with a free copy of this audiobook. The fact that I received this audiobook free of charge has in no way impacted my review.